The final day was really interesting. It started with a keynote from Eben Moglen. This got a quite emotional response from most people. 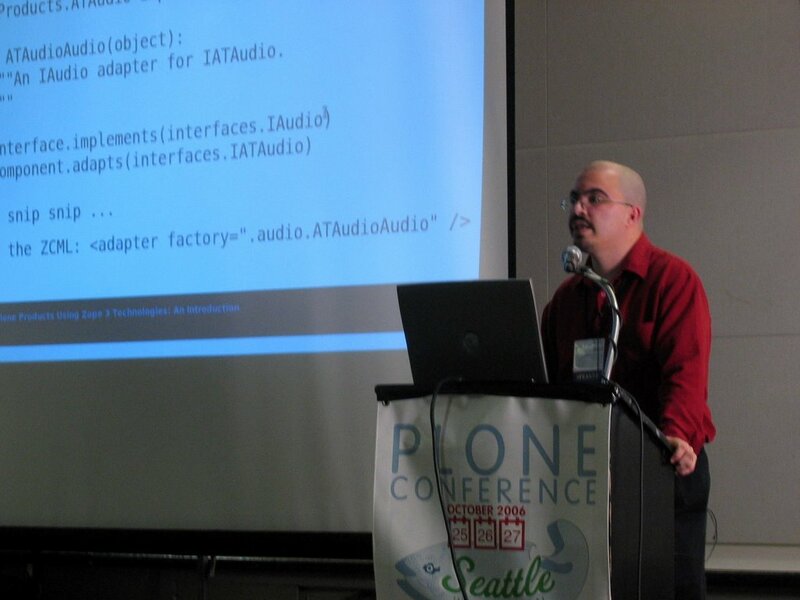 After this Alexander Limi highlighted the fifteen most exiting features of Plone 3. 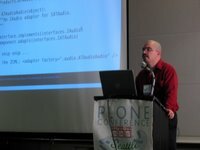 After a short break I went to the talk from Joel Burton about making Plone simpler for end users. He had some really good ideas and ready to go tweaks. A lot of these tweaks should be automatable so maybe I will write a burtonizer product. Phillip had an interesting talk about viewlets in Zope 2. It seemed really nice but may be a bit difficult for scripters to understand. Although the current macro mess is pretty bad as well. We had some great snacks during the break. 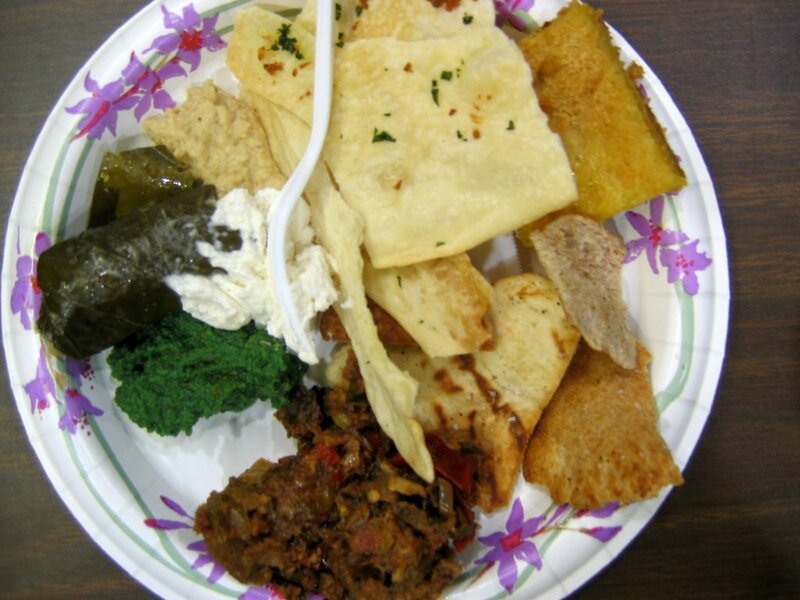 This day they served mediterainian tapas. One of the days highlights for me was Wichert’s talk about PAS (the Zope 2 version). He really made it clear for me where everything goes and what it does. So when I will need to use it I now know what to do. An example of a usecase I know have an idea about how to implement is RSS feeds that need authentication. Most RSS readers don’t understand the Plone login form. So if you want to access the feeds from the reader you need to supply the proper credentials via basic authentication. What we want is that normal users go through the login form and RSS readers use basic auth. To do this you create a challenger plugin. This can be used to differentiate based on the user agent or some detectable propertie in the url. The lightning talks were the closing talks. It was fun to see these as they are always fun due to the frantic pace. After these the conference ended. As far as I am concerned this was the best IT conference I have ever been to. My thanks go out to all the people involved in making this happen. Kapil’s talk about relational Alchemist was really good. The technologie will enable a lot of people to integrate Zope (en therefore Plone) efficiently with RDB systems. Because of the use of SQLAlchemy as a base the database can be really bad an it will still be possible to integrate. This will be really nice to use to integrate with other applications. This day I decided to go to the lightning talks. These were really interesting. Unfortunately I am a bit late with blogging this so I don’t rember all the details anymore. The first day went well. After checkin in (which was really fast) we received our conference info. It we got a really slick looking folder with program etc. inside. The start of the day went really well. Well, aside from us being silly enough not to bring european to american power converters that is. Being the laptop addicted people we are we made acquiring these converters the next task for the day. At the hotel we were told there was a radio shack nearby. After a few minutes walking we found it. Unfortunately they were closed till nine. After drinking a bit of tea at a local coffee house we got our adapters. Talking about the tea, the water here is really different. Unfortunately not in a good way. It has lots of chloride in it. You can smell it everytime you open a faucet. This makes all tea taste really funky. So I will go with the flow and start drinking more coffee (mostly decaffe to make sure I don’t bounce of the walls). The snacks served in between talks were really good. If I have to name a downside it would be that I didn’t know before hand what most of the things tasted like. Being my usefull carefull self I put a big scoop of green stuff in my mouth. This had the unfortunate side effect of setting my head fire a few seconds later. Other experiences like this were tasting something which looked like sour cream which turned out to be some sort of sweet. All in all it was a excellent start of the conference. I hope to see some great presentations and talk to nice people today as well. Being my first large trip I must say that it was quite nice. Aside from a but-ache it was quite comfortable. The inflight movies kept me entertained. I also managed to take a few pictures through the airplane window. Most of the time there were only clouds to see but there were a few clearings. The trip to the hotel was a bit more difficult than needed to be. We first used the bus to get down town. The driver was really friendly and helped us out on where to go next. Unfortunately the next driver forgot to tell us when we needed to get off. We did ask him before hand, guess these kind of things happen. Because of this detour we did get to see some more of Seattle. When we traveld back the bus driver told us to take another bus. Because we figured we were in the neighborhood we didn’t bother with taking another bus. After walking (and asking for directions a few times) we finnaly arrived at our hotel. It is really nice. After taking a short break Jan and I went to the meetup place. It was a sports cafe with a lot of tv’s. We both had our first buger of the trip. Boy, the Americans know how to make burgers. This was the last bit of the trip. As we were both pretty tired we turned to bed early. All photos of the trip are online. Check them out at gallery.